Apologies for the delay between posts. I have a few backdated posts coming up. Took a Monday off work to go fish with my old man. Strangely enough, there were already people there and more came after we arrived. It is always quite hard to get front spot on the wharf as it seems to be the best position. We eventually got there after some people left. We fished from about 12pm – 4pm and it was tough going most of the time but there were bursts of Silver Trevally every now and then. 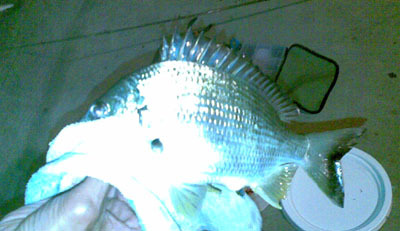 We managed to catch about 15 in total, most about the 25cm size with two keeps at around 33 – 35cm. All were caught on small bits of cut up yellowtail. 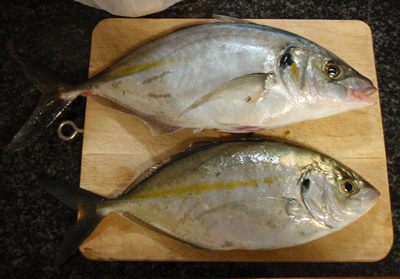 Trevally, pound for pound, one of the best fighters so make sure you have some heavier line if you intend to target them! By 4pm, the whole wharf was filled with people, quite ridiculous on a Monday really. Not the most comfortable place if you’re looking for a quiet fish. Went for a night session of squidding at Walsh Bay with my brother after work on Thursday night. Not one single person there which was what we came to expect on a work night. Conditions were a bit cold, but not much wind around. We had a few hook ups but not after they fell off the jig a few times. We found that the tentacles were shorter than usual. Ended up with 3 small ones for the night. Here’s a pic of one of them. Apologies for the grainy photo, only had my mobile with me. Plenty of good yet undersized bream for the rest of the night. 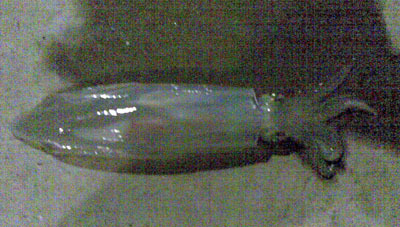 I managed to pull up a decent arrow squid not long after (apologies for the grainy photo, the digital camera is broken for now). Cut it up to cast out in hope of a jewfish but no luck. Had a few bites, but mainly small bream. All in all a good days fishing in deep water with plenty on offer.